it should be reliable in prolonged, professional use. To satisfy these criteria, Trevor has scrutinised every element of Absolute Zero's design to optimise its performance. The sturdy, vented cabinet design complements the 170mm low-frequency driver to give smooth, extended bass response and the soft-dome tweeter is mounted in a proprietary waveguide to ensure controlled dispersion. In the tradition of all good monitors, the wide frequency response remains even at all listening levels, both on and off axis - so you can be assured of consistent, dependable results every time. Furthermore, special attention has been paid to the impulse response of the system in order to give the most natural, uncoloured sound possible. Absolute Zero offers superb all-round performance, is remarkably versatile and comes at a price that is truly affordable. The Tweeter - Absolute Zero's tweeter is a custom-designed catenary-profile soft dome unit which exhibits all the extended high frequency characteristics of standard metal dome tweeters, without sharing any of their harshness. The tweeter is recessed to help protect it from surface impacts. The Bass Driver - Absolute Zero uses a new 6.5"/170mm bass driver with a 30mm voice coil, providing extended bass response with high power handling capability. The Waveguide - Absolute Zero's proprietary waveguide serves to "time-align" its tweeter with its bass driver, and to restrict the tweeter's dispersion to a 90° angle. This reduces cabinet-edge diffraction and the risk of acoustic feedback in sound reinforcement applications, whilst increasing high frequency power handling. 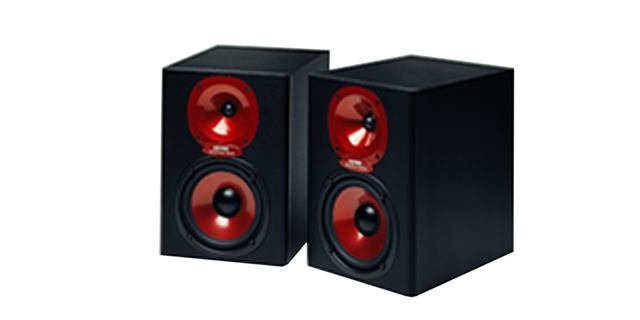 The Port - Many monitors utilise deep port designs positioned at the front of the cabinet, which can cause midrange response to vary by as much as 6dB. Absolute Zero's deep port is rear facing, guaranteeing midrange consistency. The Cabinet - Many small cabinet speakers suffer from diffraction problems in the upper-mid frequencies caused by sharp vertical edges. In contrast, Absolute Zero's vertical edges are contoured to minimise diffraction from reflected sounds. The Connectors - Poor quality connectors are often the weakest link in the signal path, reducing signal quality from amplifier to speaker. Absolute Zero uses only top-grade gold plated binding posts which give better contact for many years. Custom Components - Many of Absolute Zero's components, including its tweeter and bass driver, are exclusive to Spirit to ensure that performance is not compromised by the use of off-the-shelf designs. The in-line driver array, with its wideangle tweeter, means that Absolute Zero may be used horizontally or vertically. With flat response up to 30° off-axis, speaker angle is less critical than with many monitors. In addition, the rear-ported design not only makes for a smaller front baffle area but also allows the speaker to be used in mid-room positions. Absolute Zero is rated at 95 Watts RMS but its high quality design permits the use of more powerful amplifiers, albeit with caution. The sturdy, recessed binding posts will accept bare wires, 4mm 'banana' plugs or 6mm fork terminals. Accurate monitoring is all about hearing a faithful rendition of your programme material. But sometimes your judgement can, quite literally, be 'coloured' by the environment in which you're working. High frequencies from wide dispersion tweeters can reflect off nearby surfaces, creating unwanted echoes. In imperfect or untreated acoustic environments, it is useful to control dispersion. Absolute Zero's controlled dispersion of high frequencies means you hear more of your music and less of your room.